Share your own list in the comments below, and online with the hashtag #1010thx. For the last several years, I have made a habit of using this date as an excuse to make another gratitude list; a list of 10, of course. Shared now, should it be of interest. The call of birds. At home in Uganda there are so many, many birds who sing to us early in the morning, and accompany us all day long. And at home in Florida, a nearby neighbor has an aviary which hosts a flock of birds who are most chatty, and most lovely. The way my kids are making sense of their world. I love hearing their thoughts, reading their tweets, and embracing this stage of their human experience. A fictional mystery that intrigues the brain, tugs ever-so-slightly at the heart, and leaves the observer delighted when it is solved, and yet completely free of the anxiety associated with real-life mysteries. Plants that bloom in the fall. Outside the window–just above my workspace–a large green bush is just producing intensely orange blossoms. I believe that the Divine likes to party. It seems He’s always decorating for the next soiree. Fresh herbs. They please so many of the senses. Watching them grow. Enjoying their fragrance. The coarseness of parsley, the bristle of sage. Their intense flavor on the tongue. The magic of post. Not the electronic kind. The old-fashioned kind. Mail. I mean, think about it. Two days ago, a friend in Denver took two boxes of educational toys to her local post office. In just a few weeks, those very same objects will appear in our post office in Entebbe, Uganda–10,000 miles away–all thanks to human ingenuity and cooperation. Amazing. For my earlier lists of 10 on 10/10, click here. 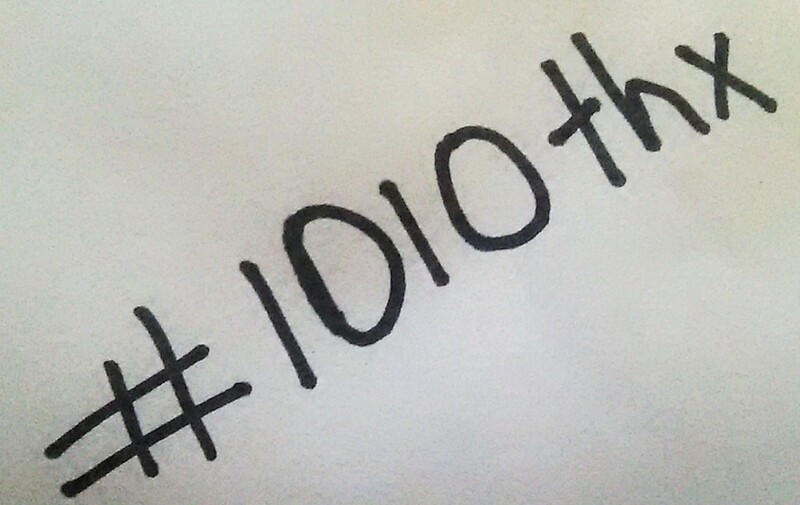 And remember to post your own 10/10 list in the comments below, and online with the hashtag #1010thx. Your #1 especially touches my life.I love to hear the birds sing.Early in the morning when it is warm enough I love to sit on the porch with my coffee and listen to the morning songs and in the evening just at dusk there is a particular bird who sings a glorious melody.I have had some hearing loss since I was young and in recent years had lost the ability to hear the wonderful songs of the birds.Just a few years ago we managed to come up with enough money for me to get hearing aids and one of the things I was so blessed by was the ability to hear the glorious songs of the birds again. 1. Today, my daughter’s 27th birthday, the age I was when I had her. 3. Earl Grey tea in the morning. 4. A clear jar filled with memory stones. 5. A wedding last night of a dear friend who was like a shaken bottle of soda, ready to explode with happiness. 6. The wake, later today, of a life well lived. 7. The quiet of a sleeping household in the morning. 8. The arrival of fall. 9. The power of gratitude. 10. Anticipation for a week ahead.